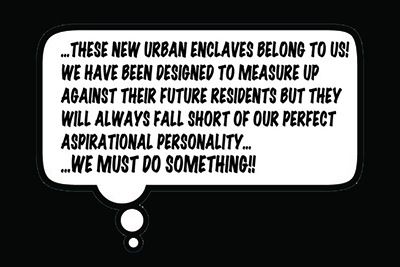 In my 2012 book PEOPLE LIKE US, I investigated the cast of characters represented in the hoardings of new development, the 'ghosts in reverse' of virtual urban citizens colonizing the future of the city. In 2015 in Cambridge, I choose to 'activate' these people as embodiment of real characters, reclaimed as speech-acts in a vacant discursive space of publicness created by the rendering of urban spaces yet-to-be and their affective agency. In RISE OF THE ASPIRATIONALS the ghosts become themselves the embodied target of dispossession, eviction and displacement enacted by the real aspirations of home ownership and capital investments in new built developments. In other words the Cambridge ghosts act like ventriloquist channels, actors in a Bildungsroman for a community in danger of being cleansed out of a space they believe to be their own. As the hoarding narrative of coming into consciousness develops in the speech bubbles, the ghosts realise their predicament as exploited labour. The knowledge of their now misplaced aspirations turns first into anger, despair and sense of loss, then into collective awareness and finally into discussing attempts to resist their own evictions.